Stevio...LA LA Lovin' It? : Milkcrate brings it back...Old skool Pete Nice classic! Milkcrate brings it back...Old skool Pete Nice classic! Back in the 80s Def Jam was the don of rap...so that made 3rd Bass's 1989 "Catcus" album down by law. Balitmore's Milkcrate (Aaron LaCrate) recognized the impact that 3rd Bass M.C., Prime Minister Pete Nice, had on hip hop in the late 80s. That's why Milkcrate printed up a tribute t-shirt that blesses us with a rare meeting of hip hop greats...Pete Nice with N.W.A. 's Eazy E and Dr. Dre and MF Doom, aka Zeb Love X. 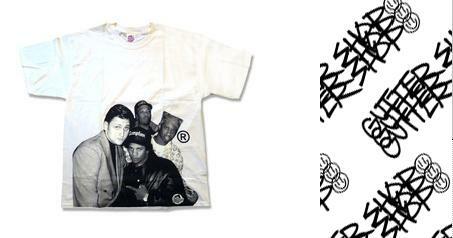 "This classic tee is an official collaboration between MILKCRATE NYC and the 'Prime Minister' PETE NICE. That's right: Official. The photo print on the front of the tee is from an old pic from Pete Nice's personal archives, taken backstage on tour sometime during the 90's. It features an incredible and improbable group: Pete Nice, Eazy E, Dr. Dre and MF Doom (or Zeb Love X at the time).